Aside from knowing that white grubs wreak havoc on lawns, there’s a lot to learn about these little larvae. White grubs are the larvae of scarab beetles. 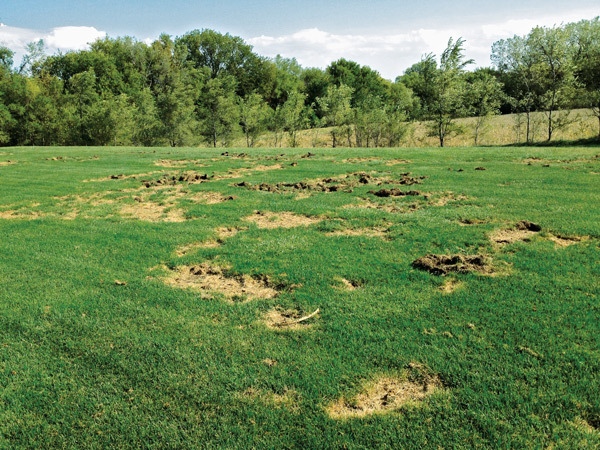 There are about 10 native species of grubs that damage turfgrass in North America, including masked chafers, May beetles, green June beetles and the black turfgrass ataenius. The Japanese beetle, European chafer and Asiatic beetle came from Asia and Europe. Of the white grub species, Japanese beetles and chafers are the most difficult to control. The May and June beetles have a two- or three-year life cycle depending on the species, while other significant species have a one-year life cycle. White grubs can be identified by the spines or hairs on their last abdominal segment, also called a raster. The arrangement of these bristles is a key indicator to determining the species present. The majority of grub damage doesn’t come from the grubs themselves, but from animals digging and feeding on white grubs. Moles, raccoons, skunks and turkeys are the most common animals that destroy turf when feasting on white grubs. Read more: To figure out what’s causing a lawn’s problems, lawn care operators have to do a little digging pf their own. Here are 3 steps to help identify turf insects. Sources: Rob Golembiewski, Bayer Green Solutions Team, and Matt Giese, technical services manager, Syngenta.